Welcome 2014! I always look forward to a new year and a new start! I’m not the type to make lists of resolutions, but I do find that at this time of the year, I refocus. I try to be more mindful of my underlying values and readjust where I might be a bit off-track. I definitely have to be honest – the last month has been a feasting free-for-all!! When my body starts screaming out for anything green, I know it’s time to readjust the diet! So, here is one of my favourite salads with the emphasis on green! My friend, Sharon shared this with me many years back and it has become a family favourite. So much so, that when I asked my sister what I should bring on Christmas day, she said, “You know what I want you to bring…your broccoli salad!” Really??? For Christmas dinner??? But I did anyway and of course, it was delicious! Some of you may cringe at the amount of mayonnaise and sugar the dressing has, but I use ½ fat mayo and I play with the amount of sugar until I like the flavour. (the original recipe called for ½ cup of sugar!) You also do not need to add the whole batch of the dressing. Just add the amount you prefer and use the leftovers on another salad. I also suggest that you make your own curry powder. I just took a course on curries and the teacher showed us what a huge difference fresh, homemade curry powder makes. I went home and threw out all of the old spices that have been languishing in my spice drawer, and have vowed to use fresh spices from now on!! I have included a recipe for the fresh curry powder below. I hope you enjoy this salad as much as my family does! In a small mixing bowl, mix together the ingredients for the salad dressing. Refrigerate for at least 2 hours before serving. The dressing will have more flavour if it can be made 1 day in advance and kept in the fridge until serving time. Be sure to adjust to your own taste. If you like it sweeter, you can add more sugar, or if you like it spicier, add more curry powder. Fry the prosciutto or bacon until crisp and drain on paper towels. Then shred into bite-sized pieces. Toast the almond slices and cool on a plate. 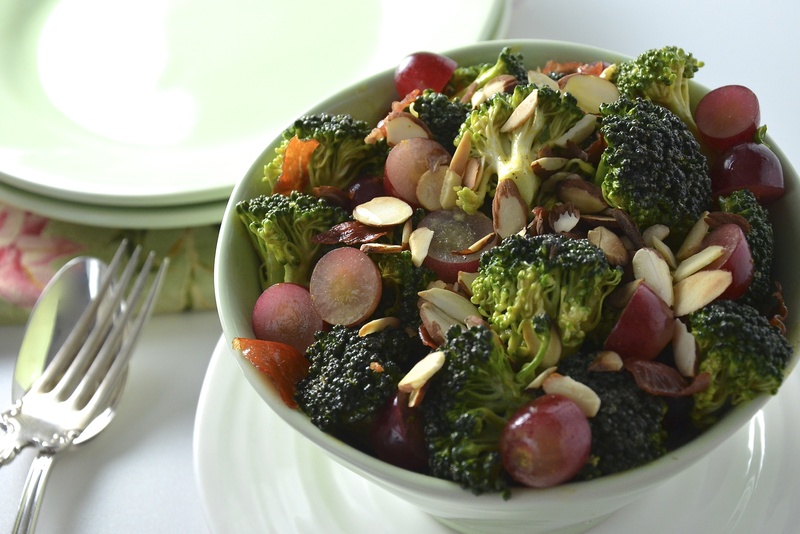 In a large salad bowl, add the broccoli, grapes and green onions and toss together. Add the dressing and toss until incorporated. Add the prosciutto and almonds and toss lightly. Serve as a side dish with grilled meats or sandwiches. Blend the ingredients together and store in a glass jar in a cool place. Hey Geraldine! Thanks so much. Hope you get to try it! Happy New Year to you! Hi Caran. Thanks so much! Isn’t this the best thing about blogging, though? We discover all of these new flavour and food combinations! Glad you stopped by to comment! Happy New Year to you. wow you took a class on curry powders?! im intruiged! but also this salad looks like a great healthy option, especially if its good enough to make the Christmas dinner table! I know, I really love curries…we did a Vindaloo and some Garam Masala in the class too!! It is so good when it it fresh! Glad you like the look of the salad. Thanks so much for stopping by to make a comment. Cheers! Well, that is so kind of you!! Glad you are still enjoying the posts and photos. Hope you had a great holiday and Happy New Year to you!! Thanks Liz! Yup, I eat one healthy salad a day, almost 365 days of the year! Crazy, huh? You have a great week too!